UPDATE: The PRC IME MSPY 2010 update has been released! Please see my MSPY 2010 Chinese Pinyin IME Update FAQ for more information. Works in Windows 7, Vista and XP SP3 with or without Office. UPDATE: The Taiwan IME 2010 update has been released! Please see my Taiwan IME 2010 Update FAQ for more information. For Windows 7, Vista and XP SP3, and does not require Office 2010 or any other version of Office. This page is archived for anyone who needs to know about the MSPY 2007 update for any reason, but everyone else should download the PRC IME MSPY 2010 Update and the Taiwan IME 2010 Update (released with but does not require Office 2010). Is there a way to update/upgrade/repair my Microsoft Pinyin input methods and other Chinese features without buying an upgrade or reinstalling Windows? Yes! A free download from Microsoft offers an upgrade to the latest verson of the "Microsoft Pinyin" and "Microsoft New Phonetic" Chinese Pinyin input methods. The free MSPY 2007 update is for 32-bit systems. Unfortunately they never made a free version of this update for 64-bit Windows until the MSPY 2010 update. Only the 2007 update for 32-bit systems is free. This is essentially the same 32/64-bit IME update distributed with Office 2007 Language Packs. (Not Windows Language Packs: Office Language Packs.) More on this below, under "System Requirements". First, what does this update do? Windows XP users get the latest Vista/Win7 Simplified/PRC MSPY "New Experience", which offers better candidate prediction and even the option of using the PRC IME for traditional and extended character sets. Windows Vista and Windows 7 users will find only three very minor additional features in the 2007 update. See details on the new features below. Install this after system Language Packs to avoid replacing MSPY 2007 with older IME files. Here I'm referring to language packs for the overall Windows system, not an Office language pack. Also, if you remove a Windows Language Pack for some reason and find that it has deleted an IME you still want to use, MSPY 2007 is a good way to get that input method back. This free update is for 32-bit systems only. Microsoft did not start making a free update for both 32- and 64- bit systems until MSPY 2010. If you want to install the 2007 update on a 64-bit Windows system, your only choice may be the Proofing Tools disc included with Office 2007 language packs for Chinese, because it includes this update with both 32-bit and 64-bit installers. If you need to purchase one of those for a 64-bit system, here's what I know: I have tested the Office Multi-Language Pack 2007 (here's a link to it on Amazon.com) which offers 36 languages including Chinese, with English installers, for USD $189 (unless you have an academic or enterprise discount), plus Office 2007 of course. The cheaper single-language Office Language Packs for Chinese (direct from Microsoft) may also include this, I just haven't tested them yet. There are three of those: Simplified, Traditional, and Traditional-HK, all with Chinese-language installers, USD $24.95 each. NOTE: The Office 2007 Language Packs will not install in Office 2003, but the 64-bit MSPY update is a separate component and the installer may let you install it. I haven't tried this. If you are desperate enough to pay for a Language Pack to attempt this, please let me know if it works for you. If you have a 64-bit system and don't want to purchase an Office 2007 language pack, then to deal with a broken Phonetic Guide in MS Word please use the MSPY 2010 update or switch to uisng Chinese fonts with ruby text included. For other problems please contact me and I'll do my best to help. Despite the MSPY 2007 Chinese-language installation package, my MSPY menus and even the Help files remained in English. I have Office 2007 so I installed the full MSPY2007.msi version. I found only a few minor new features that are not in the "Chinese Simplified - Microsoft Pinyin IME" keyboard that comes with Vista. The new input method will appear in the control panel's keyboard list as "Microsoft Pinyin IME 2007" (where it will be automatically installed and selected as your default simplified Chinese input method), and it slightly changes the names of the input methods as they appear in the language bar as you can see to the left. In addition to updating XP systems to the new features introduced in Vista, MSPY 2007 also offers three new items in the Option menu that to not appear in Vista or even Windows 7: Dictionary Update Service, Register New Word, and Mis-Conversion Report. The Dictionary Update Service is not even included in Office Multi-Language Pack 2007 proofing tools. You get get all three with this update. These are not major upgrades for most Vista or Win 7 owners, so you may not want to bother installing in Vista or Windows 7 unless you want to try fixing a problem in your system. But, if you are a Windows XP user you would definitely benefit from upgrading to this latest version of the Microsoft Pinyin input methods. 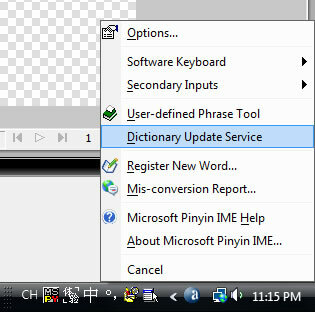 For help using your new upgraded IME, see my pages on finding Windows 7 and Vista Chinese IME English Help Files.